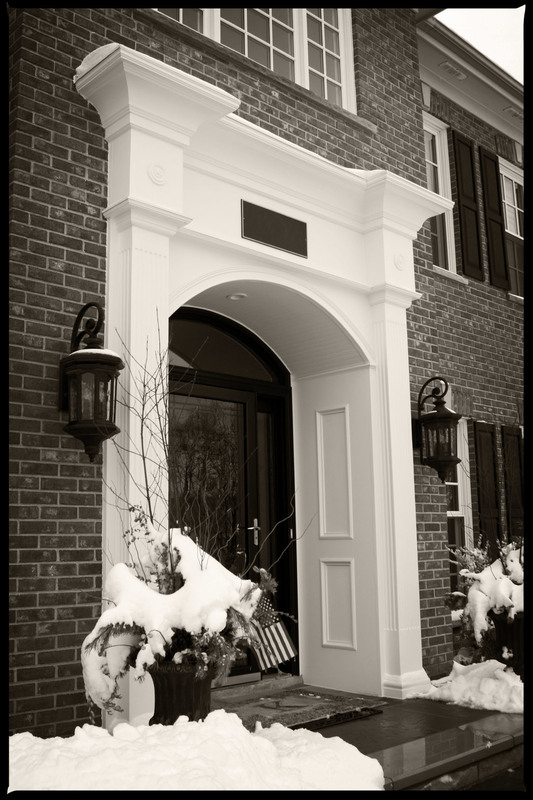 The front entry door, surrounding millwork, windows, and entry walk were replaced on an existing Neo-Colonial styled house. The homeowners were looking to replace the existing spec entry surround with an entry that included appropriate proportions and detailing and brought a more substantial feel to their front entry. The solution references Colonial Adam precedents, while being careful not to be overly fussy on a house with relatively spare existing exterior detailing. All materials used for the surround were rot resistant, minimizing the need for future maintenance. Serving Wheaton, Glen Ellyn, Naperville, Oak Brook, Geneva, St. Charles, Hinsdale, Burr Ridge, Barrington and other west suburban communities. Design services include new homes, room and second floor additions, and kitchen remodeling.